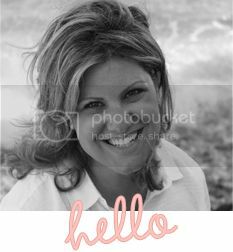 I happened to be at Whole Paycheck (AKA Whole Foods) one afternoon picking up something for dinner, when I decided to take a stroll down the baking aisle (surprise, surprise!). I've found that Whole Foods tends to have a few different baking ingredients and mixes, although most of it is organic or gluten-free. Looking at the chocolate chips (because as a baker, you've got to have a stock pile), I noticed a bag of dark chocolate chunks that I haven't seen before. The wheels started turning, and I thought they'd be great in my favorite chocolate chip cookie recipe with some dried cherries. I'm sure the cookies would work with regular semi-sweet chocolate chips. You could always buy a bar of good dark chocolate and chop it into chunks. 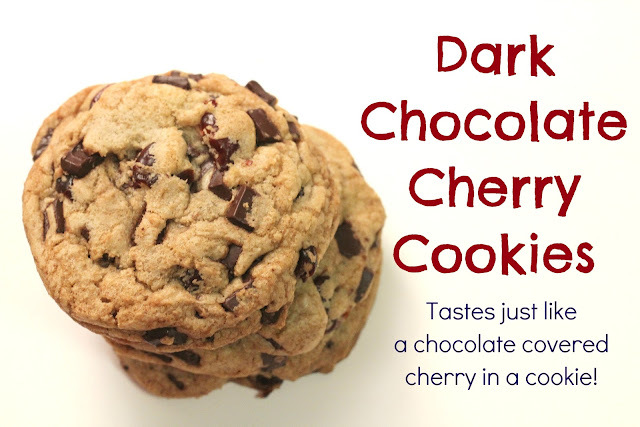 I wouldn't use fresh cherries though -- too much juice in them, which would make for a mushy cookie. 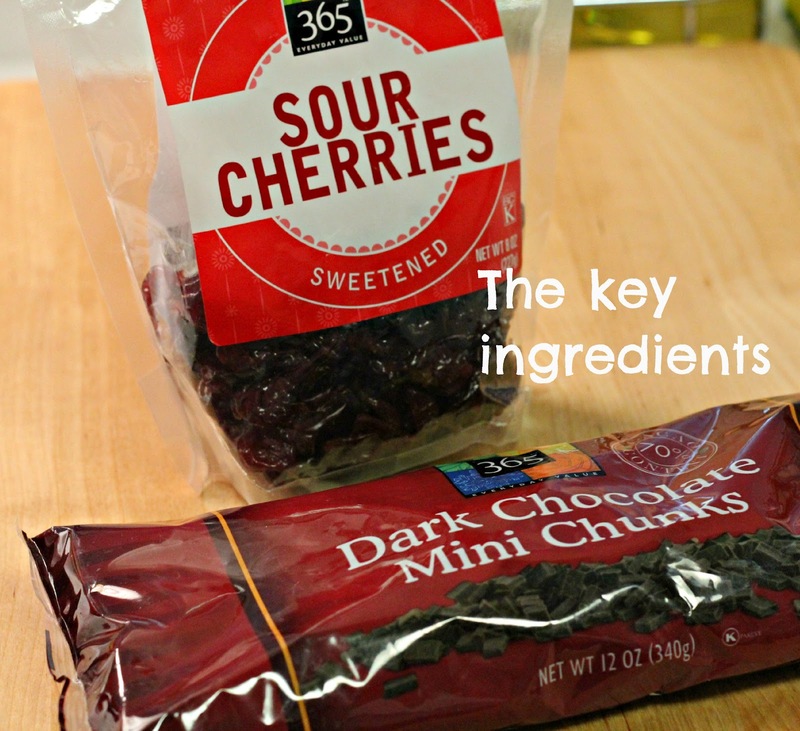 Mix the ingredients together, adding the chunks and cherries last. 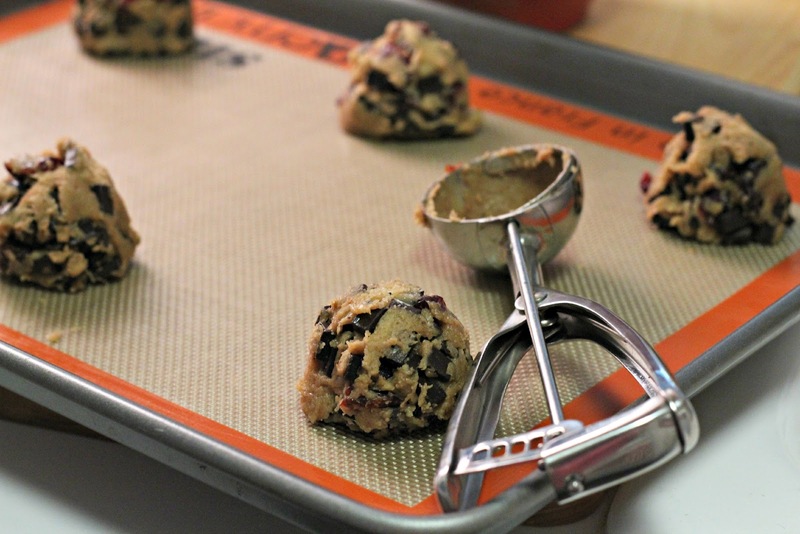 Use an ice cream scoop to scoop out the dough, which will give you nice, evenly sized cookies. I fit about six cookies on my cookie sheets. Do give them a little bit a room, as they spread a little. Use a Silpat if you have one, or parchment paper if you don't. Bake for about 17-18 minutes (check your oven, and don't let them get too brown). Let cool on the cookie sheet for a few minutes and then move to a cooling rack. Sift together the flour and baking soda into a bowl and set aside. Pour the butter into your stand mixer's work bowl. Add the sugar and brown sugar and beat with the paddle attachment on medium speed until well-mixed. Whisk together the whole egg, the egg yolk, milk and vanilla extract in a measuring cup or separate bowl. Never crack eggs over your dough/batter in case a loose shell gets in the mix! On a low mixer speed, slowly add the egg mixture. Mix until thoroughly combined, about 30 seconds. Gradually pour in the dry ingredients, stopping a couple of times to scrape down the sides of the bowl. 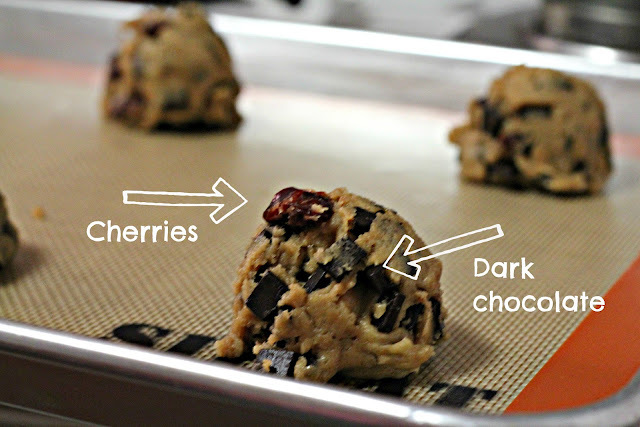 Once the flour is worked in, drop the speed to "stir" and add the chocolate chunks and dried cherries. 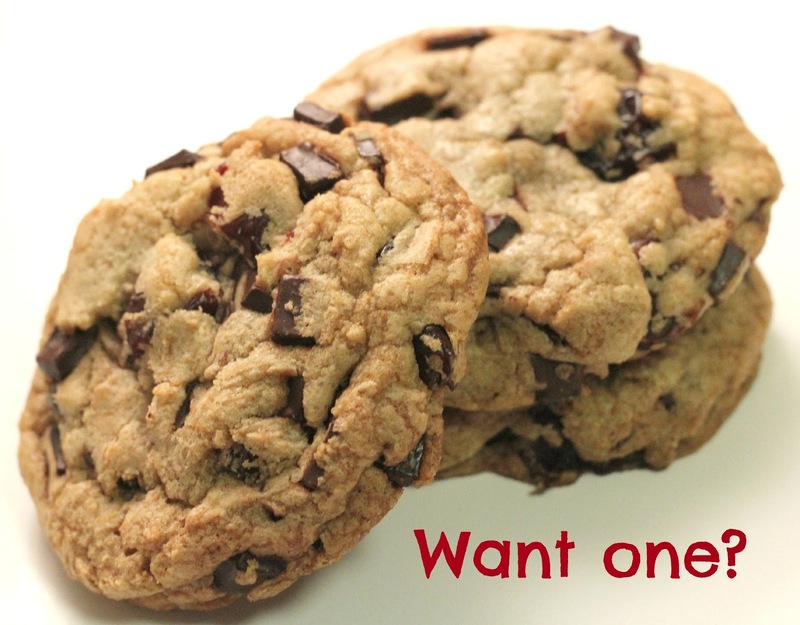 If you want larger cookies (like mine in the photo), scoop the dough using a 1/4 measuring cup or an ice cream scoop. For smaller cookies, use a cookie scoop (a good rounded tablespoon). Make sure your cookie sheets are either lined with a Silpat or parchment paper. You should be able to fit about 6 cookies per sheet.